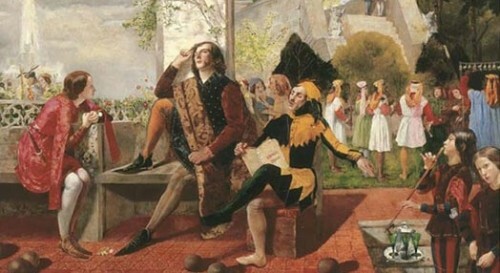 Viola in Twelfth Night had the confidence to dress as a man. The women in Shakespeare’s plays are a mixed bunch. They display a range of attributes, some admirable and some less so. They are playful, flirtatious, fearful, submissive, outspoken, brave, self-deluded, gossipy, intelligent, lovesick, self-righteous, charming, shy, clever, quick-witted, slow, slutty, sharp-tongued, loyal. Ooh, look, just like women in real life. Desdemona in Othello goes to Cyprus with her soldier husband, pretty much an army wife. Lady Macbeth is ferociously ambitious and determined that Macbeth will get right to the top. Juliet is a teenager head-over-heels in love with her first boyfriend. Beatrice in Much Ado About Nothing is the girl we see at the beginning of many romcoms, sparring with the guy she says he hates but into whose arms we know she will eventually sink. Women in Shakespeare don’t go to work in the way we understand it. Their tussles and battles take place in the personal arena, not the professional. They have to deal with kings and princes and generals and controlling fathers rather than with colleagues and bosses and team leaders. But some aspects of how these women act can guide us towards ways of behaving which will help us to step forward and be heard. In Twelfth Night, Viola is shipwrecked in a strange country. She doesn’t waste time bemoaning her fate but susses out the local situation and identifies the person most likely to give her work. Then she goes to him and asks for a job. Viola turns the disaster into an opportunity for more than mere survival, and eventually (spoiler alert) her resourcefulness is rewarded. Viola has to disguise herself as a man to have freedom of movement. Assuming the role of a confident person is a way of accessing the kind of behaviour that gives you credibility. You can learn how to manage the impression you create so you are perceived as self-assured. Portia in The Merchant Of Venice is an eloquent speaker. 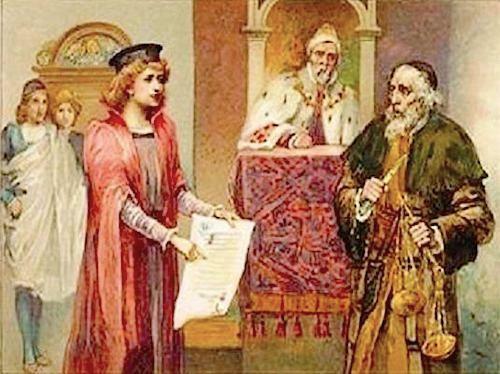 You might know her courtroom plea to Shylock to show mercy to Antonio. The rhetoric is sublime as Viola talks about the quality of mercy which descends from on high like gentle rain and blesses both the giver and the receiver. It makes you want to burst into applause. If you speak clearly and articulately, people listen to you and pay attention to what you say. Again, this is a skill you can develop. If you don’t have a natural gift of the gab, start small. Prepare something in advance, an opinion or suggestion, and practise saying it. People may not agree with what you say but what matters is that you speak with authenticity. Portia, in spite of her glorious words, could be seen as a bit too all-mouth. When she doesn’t persuade Shylock, she produces another card, a very clever one as it happens, but pushes home her point with the very lack of compassion she has just decried. This makes her less admirable, I think, and when she ends up married to the spendthrift gold-digger she has the misfortune to fall in love with, you think, well, there you go. Portia too had to dress up as a man to appear as a lawyer in court. Oh dear, 450 years on, and we are still engaging with gender-related issues of power, presence, authority. But at least we don’t have to put on doublet and hose to be taken seriously.